1935. 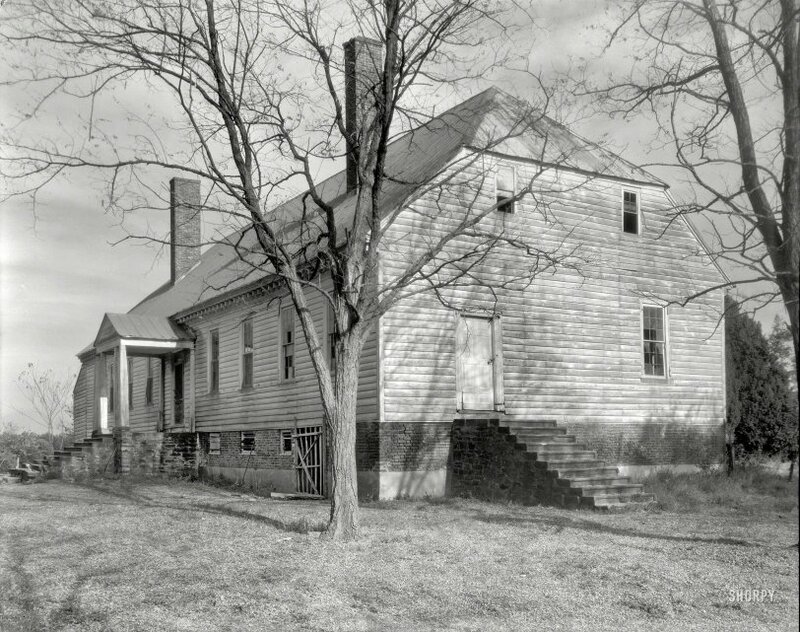 "Scotchtown, Chiswell Lane, Beaverdam, Hanover County, Virginia. Structure dates to 1698. Related names: Miss Sally Taylor. Built by a Scotsman named Chiswell. Once the home of Patrick Henry and Dolly Madison." 8x10 inch acetate negative by Frances Benjamin Johnston. View full size. Submitted by StefanJ on Mon, 03/05/2018 - 11:21am. I would have called it a half-hipped roof. And it did have some functional properties in some areas. It did reduce the wind loads on large exposed gables. As some people had to find out the hard way when they replaced the half hip by a full gable to more usable space and lighting in the attic during remodeling. And their new full gable caved in during a storm. Submitted by Hayslip on Sun, 03/04/2018 - 11:46am. When roofs were thatched in England and Europe the tip of the gable was lopped off to weave the thatch around the corner. This building is a sort of homage to that look as it is mostly decorative. The term has been dropped from most dictionaries. Submitted by kozel on Sat, 03/03/2018 - 3:29pm. Submitted by asharpe on Sat, 03/03/2018 - 3:02pm. Something very unfinished-looking about stairs with no handrails. I'm sure it was common, but the combination of no handrails and no lights seems like an accident waiting to happen. Submitted by Dale Neiburg on Sat, 03/03/2018 - 2:45pm. Now disputed whether Dolley Madison ever lived there.